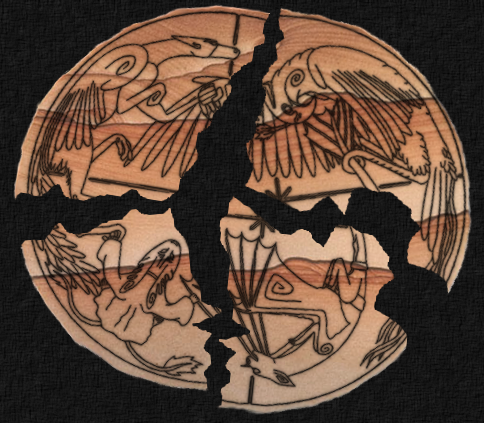 Hear now a tale of the land of Sencriton, which boasts four civilization-building races among its teeming varieties of life. (Well, at least four.) Sadly, at the time this story takes place, Sencriton is in the grip of a prolonged Dark Age. The four dominant species, once designed to be complementary, have become estranged from one another. In the absence of the cooperation and interchange that would put their unique talents to the fullest use, the progress of the world has nearly ground to a halt. Persecuted by the other races for reasons they no longer remember, the Lilkirgynyyn have withdrawn to the remotest and most inhospitable pockets of the world – frozen mountain peaks, deserts, and impassable forests. There they sustain their bodies with hunting and their minds with mathematics and philosophical discourse. Their knowledge of the world is deep and their grand ideas are abundant, but few of those ideas are ever realized. The Krippin, in contrast, have multiplied fruitfully, transforming the face of the land with agriculture and primitive industry. Organized neatly into towns, counties, and monarchic nations, they control a substantial reach of territory and fill it with ceaseless activity. Anything that hard work and a large number of hands can achieve is theirs for the taking, but the mysteries which lie beyond the immediate and practical elude their consideration. They maintain an uneasy and often war-torn relationship with the independent city-states of the Rynsor, which dot the land to the east. As intimidating warriors and inspired diplomats, the Rynsor have established a curious dual reputation for themselves. Their sophisticated culture is constantly in flux as forceful, charismatic mayors test new social systems and change the shapes of the cities. Few concepts remain in force long enough to see full development. Meanwhile, the child-like Tirinzi frolic among their coastlines and tropical islands, hoping for nothing greater than to ignore and be ignored by the other races. Ambitions, deep thoughts, and troubles are swept away by the speed of their eager, boisterous existence. Their lives are filled with delight, but irresponsible behavior tends to end them earlier than might be wished. As for the Oodavikkin … nobody quite knows if they are even sapient. They lurk in dangerous swamps, build no homes, and have never been observed to speak, but appear surprisingly clever and devious for all that. The other races hunt them for amusement on occasion, and hope they never amount to anything. Magical powers wielded directly by individuals are a half-forgotten legend in Sencriton; some would dispute whether they ever existed at all. The spiritual world and its miracles, on the other hand, are almost universally known and accepted. Each of the major races has a patron Spirit who may be summoned by anyone and asked for aid – though the Spirits are choosy and may not come. Most of Sencriton's inhabitants acknowledge that all four arch-Spirits are good beings that faithfully serve the Creator of the world and the best interests of its inhabitants. However, the majority would think of summoning only the patron of their own species. It may take only a small event to disrupt the balance of a world such as this. The sort of event, perhaps, that happens when a Krippin town sees its store of resources failing, and takes the risk of sending a mining party into Lilkirgyn territory. Lilkirgyn defenders attack the miners and slaughter most of them; but Argyryn, a participant in the fight, subsequently feels remorse. In hope of preventing future incidents, he leads his pack on an unprecedented diplomatic mission to the Krippin. But before this envoy can even set out, the Krippin have acquired a new set of problems. Their younger generation, disgruntled with the bureaucratic rules imposed by the Elders, has begun a counter-culture revolt for greater freedom and opportunity. * Book I: Second draft done. Beta reading/critique stage in progress. * Book II: First draft done. Early editing in progress.